Xi Jinping’s visit to Prague crowns two years of deepening ties — but not everyone is happy about that. Beijing views the CEE states as a window to broader relations with Europe as a whole, particularly under the framework of Xi’s “Belt and Road” initiative. The countries of Central and Eastern Europe will be crucial links between the Central Asian and Russian legs of the Silk Road Economic Belt and the final destinations in Western Europe. Meanwhile, as Richard Turcsanyi has discussed for The Diplomat, many Central and Eastern European countries are eager to claim a position as China’s “bridge to Europe,” with all the economic benefits that could entail. China reciprocated such gestures by selecting the Czech Republic as the site of Xi’s first presidential visit to a CEE state. In fact, this is the first visit ever by a Chinese president to the Czech Republic, according to China’s ambassador to the European Union, Yang Yanyi. Also according to Yang, China-Czech relations are currently enjoying their best period since the two established diplomatic ties 67 years ago. The two sides took their relationship a step further on Tuesday, inking a strategic partnership. As part of that agreement, China and the Czech Republic will set up a new strategic dialogue mechanism to further develop ties, according to a joint statement issued after talks between Xi and Zeman. Echoing the “bridge to Europe” theme, Zeman said that the Czech Republic is committed to becoming a hub in the China-EU trade network. 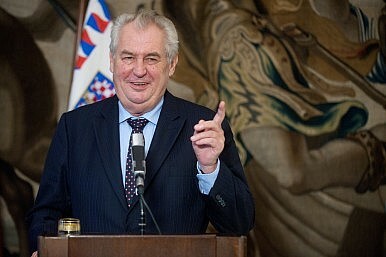 The Czech president also assured Xi that his country will go to bat on China’s behalf in the European Union. “The Czech Republic is a country that can be trusted by China in the EU and is willing to fully utilize its influence to help further strengthen China’s relations with the EU and the CEE region,” Xinhua paraphrased Zeman as saying. Not everyone in the Czech Republic shares those sentiments, however. Protesters concerned about Chinese human rights violations are making their objections to Xi’s visit known. Twelve protesters were arrested on Monday after replacing Chinese flags with Tibetan ones along a road leading from the airport to downtown Prague. More pro-Tibetan protesters clashed with Xi’s supporters when the latter group tried to cover up an enlarged picture showing the Dalai Lama with former Czech President (and noted dissident) Vaclav Havel. What’s on the Agenda for the Trump-Xi Meeting?China's Xinjiang Province Eyes Anti-Terrorism LawWill Xi Jinping Visit North Korea This Year?How Hungary’s Path Leads to China’s Belt and RoadAre the European Union and China Systemic Rivals?